Plugins, Extensions–for text! Not hair! I get a little thrill upon discovering a new place where literature can appear. From eBooks on the iPad to URLs (see Mai Ueda’s Domain Poems) to… browser plugins. Tumbarumba inserts fragments of a story into the text of regular HTML pages. Clicking the alien fragment reveals another sentence, and another, and finally the whole darn thing. Like the Shizzolator of 2003, but quieter, more subtle. Even insidious. I installed Tumbarumba and waited a few days, reading my regular news sites and blogs. Nothing. Maybe the new Firefox wasn’t compatible, as Tumbarumba was created in 2008. And then one day I was previewing a post I had written for mommy forum I’m on–and something was out of place: “her contact info is below” turned into “her contact info is below the surface and for a moment I see a distortion.” I panicked! Why did I hit submit so soon? Then something clicked (ha!) and I realized this was a little game. 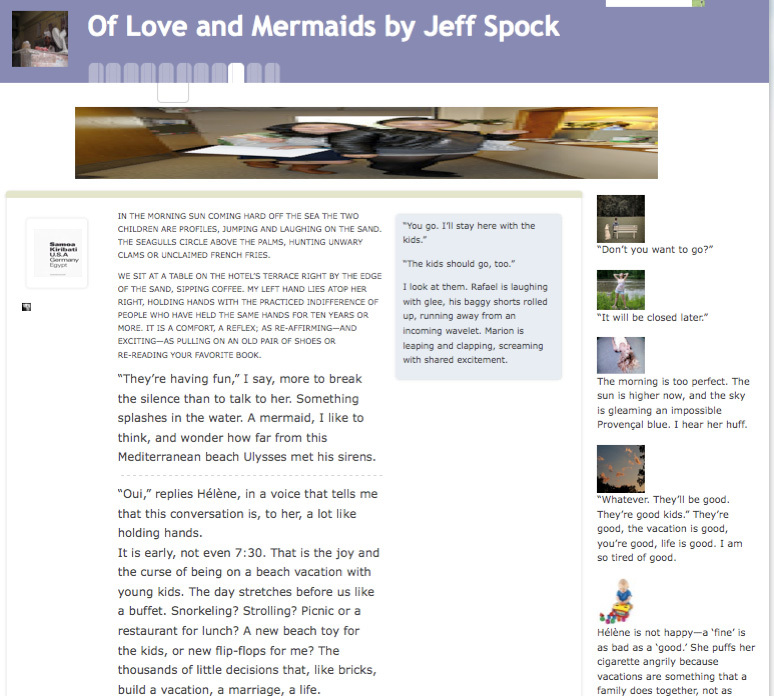 With each mouse click, the story took over more and more of the page. I like that Tumbarumba scatters the story into sidebar images, captions, page headings, anything text. Over the next few days more and more stories cropped up in random websites. And then a long silence, I haven’t been surprised by any new insertions in the past few weeks. I often roll my eyes and mentally scream: BORING! when I encounter digital art whose aesthetics rely on randomness. But this is something different. Usually we pick stories, they don’t come to us, slyly winking in the middle of a product description. I admit I wasn’t as thrilled by the content of the stories, but Tumbarumba’s plugin-as-publishing-platform is clever, appropriate, and well-designed. Thumbs up, Tumbarumba. Keeping the Web serendipitous and messy, one story @ a time. Sounds cool, Aya — almost like an instant William S. Burroughs style cut-up on your computer. I’m going to download Firefox and then try Tumbarumba out. I like this kind of thing. Do you know anything about the selection process of the stories? no, michael, not sure how they were chosen. i wonder if the creator of Tumbarumba is choosing any new stories, i should email and ask.